A revised ANZ forecast has warned that housing prices could fall as much as 20 per cent across Sydney and Melbourne and advised "stability isn't likely until early 2020". ANZ is the latest to weigh in, revising its outlook downwards amid weakening economic signals. A foreign buyer exodus coupled with oversupply, tighter lending conditions, and a potential incoming Labour government wiping out the negative gearing incentive for investors capital gains tax breaks, have all added to decaying sentiment and corrosive market conditions. ANZ again adjusted their expectations on house prices predicting a plunge of 15 to 20 per cent peak to trough, in line with forecasts from AMP Capital last month. The national average home price has dropped 3.5 percent this year with home prices in Sydney and Melbourne retreating by 9 percent from their July peak, with many homeowners now losing up to $1,000 per week in value. New dwelling approvals fell to their lowest level in almost two years in August with many anticipating the trend to continue, especially in the apartment segment. Auction clearance rates are at the lowest levels in a decade in Sydney and Melbourne and housing finance approvals are nearly 15 per cent lower than a year ago. Meanwhile, properties in both Sydney and Melbourne are sitting on the market for longer, with the average property taking nearly 40 per cent longer to sell compared to a year ago. At a time when almost every week major banks are adjusting their calls on the faltering market, price falls have continue to broaden. Earlier this week, HSBC downgraded its assessment, predicting prices could fall up to 8 per cent next year. Morgan Stanley revised its initial house price outlook of a 10 per cent fall from peak to trough nationally, to 15 per cent. SQM Research predicted a 12 to 17 per cent decline by the end of next year, highlighting that the repeal of negative gearing could cause a fall as much as 30 per cent by 2020. ANZ senior economist Daniel Gradwell said in the bank's latest research note that housing prices in Sydney and Melbourne were expected to fall around 15 to 20 per cent from peak to trough, with potential spillover to Canberra, Brisbane, and Adelaide. Unlike previous downturns in the housing market, ANZ doesn’t see the RBA cutting official interest rates in order to support prices. “We don’t think this cycle will see lower interest rates trigger a rebound in housing prices,” ANZ economists wrote. ANZ said it was unable to ­pinpoint how long banks would continue to clamp down on ­lending, but expecting housing prices to broadly stabilize by early 2020, allowing the RBA to begin to slowly lift official interest rates. 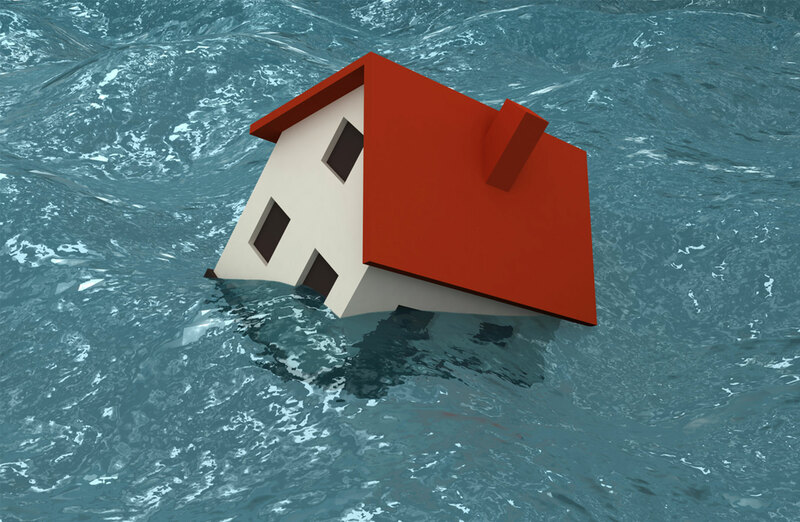 Economists are now warning Australians to prepare for the “longest and deepest” housing downturn in the country’s recent history. 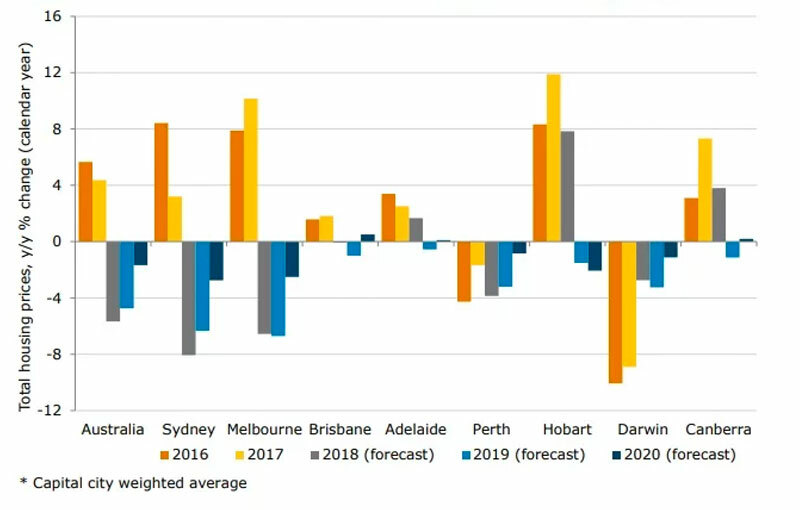 While the doom and gloom takes hold along the eastern seaboard, Hobart and Canberra continue to defy the odds as the only cities with increases in prices regardless of economic or political conditions.